Shattuck, Oklahoma - Your hometown for a lifetime - is a small town with a a big heart and lots of room to grow. Shattuck is known as a town with a vision for survival and a willingness to try new ideas. The citizens take pride in Shattuck and work together to make positive changes. People seeing Shattuck for the first time are impressed by its cleanliness. 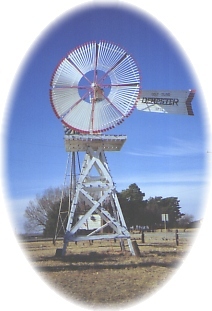 Shattuck residents are known for their hospitality and love to show off their unusual collection of antique windmills at the Windmill Museum and Park. Hundreds of visitors explore the many facets of Shattuck's proud heritage during Heritage Fest in September. Shattuck offers a clean, comfortable motel, two bed and breakfasts, excellent dining, arts, gifts, and antiques. In keeping with the narrow focus of the Shattuck Windmill Museum and Park, a half-dugout has been reconstructed at the park to show how many of the early settlers lived. It is furnished with a small iron stove, table and quilt covered bed. See how a dry, packed earthen floor actually becomes "
Six murals, depicting the History of Shattuck, are dedicated to the early pioneer families whose courage and hard work sculpted a bustling, thriving town out of an arid prairie inhabited by buffalo and coyotes. In 1997, a one and a half story homestead house was moved to the Windmill Museum and Park. This home typifies the frame structure that an early family would have built once they had moved from their "soddy." It is furnished and contains a small corner for windmill memorabilia. Shattuck Windmill Museum and Park was established in 1994 and now, 37 windmills stand in the park, with no two alike, from a little 5 foot "Star Zephyr" to the big 18 foot "Samson."